Captain Phasma, known as the 'Chrome Stormtrooper' by many fans is the hand of the First Empire. They are effectively the 'second' bad guy after Kylo Ren. 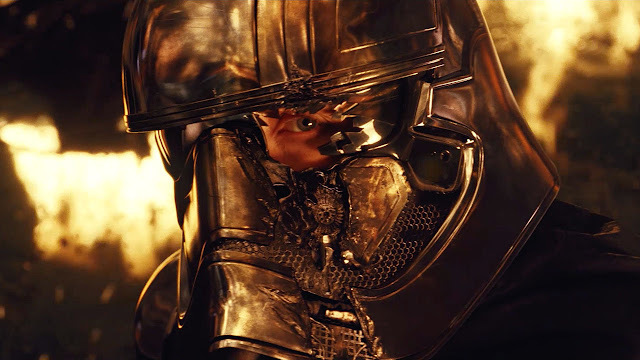 Phasma is played by Gwendoline Christie, famous for her role in Game of Thrones. Finn: Not anymore. The name's Finn and I'm in charge. I'm in charge now, Phasma! I'm in charge! Han Solo: [to Finn] Bring it down. Bring it down. Captain Phasma: You can't be so stupid as to think this will be easy. My troops will storm this block and kill you all. Finn: I disagree. What do we do with her? Han Solo: Is there a garbage chute? Trash compactor? Captain Phasma to FN-2187 "You were always scum." to which he aptly replies with the correction: "Rebel scum"
"You are a big in the system!" To Finn: "Disobedient. Disrespectful, Traitor!" Finn: You call for order. You beat us down. But when your shiny neck was threatened, you squealed like a whoop hog. The evidence blew up with the base but you and I know the truth. When I put a gun to your head, you shut down Starkiller shields. Now what would your troops do if they found out? Or your masters? Her reply "Who would believe a story like that?"